the cow's hide. It came up into the ear and down in the ear canal. I can see what looks like a bioluminous glow." 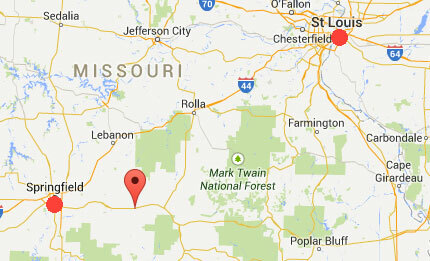 Norwood, Missouri (Google pointer) is 190 miles southwest of St. Louis, Missouri. Norwood is a small rural town of about 660 people in south central Missouri. Norwood, Missouri, is 235 miles northeast of Locust Grove, Oklahoma. November 30, 2014 Locust Grove, Oklahoma - In late October 2014, I received a phone call from a small campground owner in Locust Grove, Oklahoma, east of Tulsa. He said he had a cow ear preserved in his freezer from two years ago on February 9, 2012. He also said that he had seen with his own eyes a blue-green glow inside that cow’s ear after he used a metal detector over her bloodlessly mutilated body on a ranch in Norwood, Missouri, east of Springfield.